This morning, I set the dial on my crock pot to low and headed out the door, feeling great about the yummy dinner I was going to make. This evening I came home from work to find that I hadn't actually cooked anything. It doesn't help to turn on a machine if it isn't plugged in! Aaah! That's life, eh? We went out to dinner instead, and the blog post that I was planning to write about the aforementioned dinner will happen tomorrow instead. Has this ever happened to you too? :D yes, it happened to me several times with my rice cooker ! LOL! So funny! I've not done that one yet, although one time I microwaved my salad on accident. True story (and I don't recommend it). lol! I'm a scatterbrain. Hahahaha this picture made me lol. Bless. I did that this morning with my toast! I realized it after only a couple minutes though, unlike you. Hehehe. This post made me giggle! 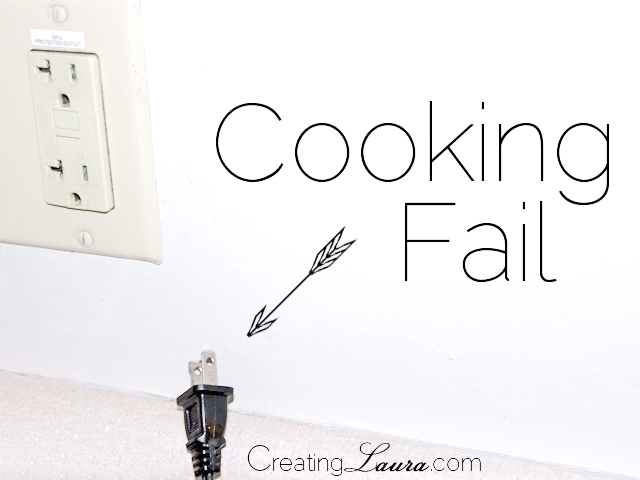 I haven't done that with a crock pot but I have done it with many other appliances. At least it was a good excuse to go out for dinner.